Haven’t you spotted this bag yet? Well, then it’s time to visit the Chanel boutique to discover more surprises. Not all the handbags are shared on their official website, so going to the boutique is always like opening a surprise box. Meet the fresh Chanel Bowling Bag for the Fall Winter 2017 Collection. I really love the half-moon shape because it reminds me of the discontinued Mademoiselle Bag. The Mademoiselle Bag was a gorgeous feminine handbag and it was as popular as the GST or the PST. Maybe it’s really an updated version of the Mademoiselle Bag, who knows? But the shape and the hardware can’t let me stop thinking that it is the her, it is her. Or maybe I have been captivated and can’t let go the thoughts – just like the girls that have felt in love with the GST and then the bag got discontinued. This latest bowling bag is crafted in half-moon shape. It’s crafted in diamond quilting, but the bottom edges are refined with leather patches. The top features the signature CC logo charm and also a leather handle for tote carry. But what’s also stunning is the large bold chain that comes with it, which resembles to the chains of the classic Boy Bags. 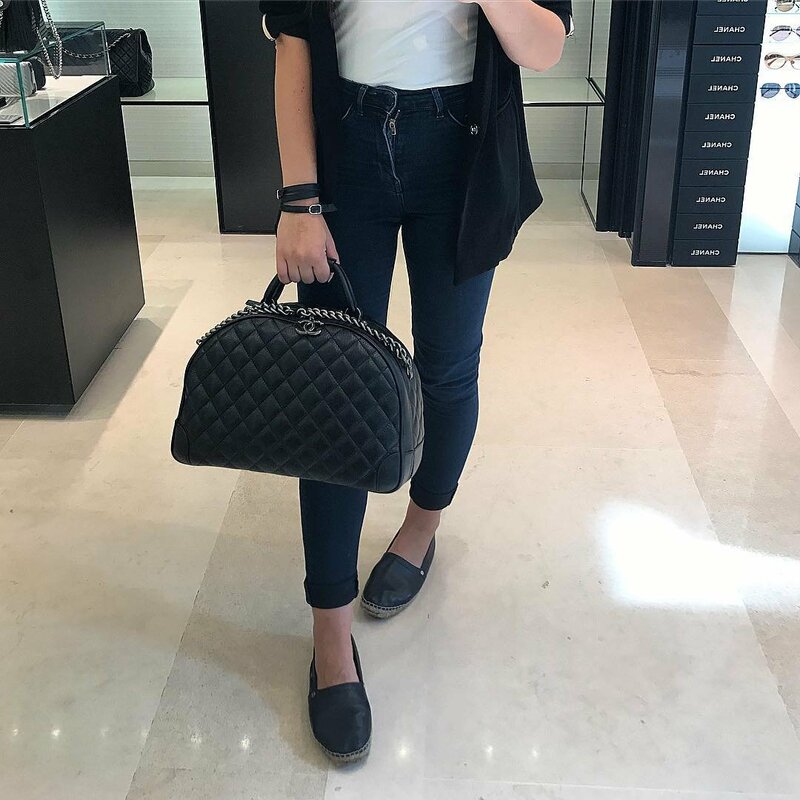 And as you can see on the Instagram picture, this bag goes well with Chanel Espadrilles. Because this is a new bag, we do not have the style code, sizes or the prices. Check with the SA for the latest details. So what do you think? Is this bag inspired by the Mademoiselle Bag or not?